Villa Stella Maris is located amidst an enchanting landscape of sandy coves, turquoise-blue fjords and astonishing rock formations. The house is situated on a tranquil property directly on the sea. From the house, guests have a fantastic view of the water, the amazing sand dune of Torre delle Stelle and the undeveloped chains of hills in the distance. The <?xml:namespace prefix = st1 ns = "urn:schemas-microsoft-com:office:smarttags" />Mediterranean glitters before your eyes underneath the midday sun. The garden, which plays host to wild olive trees and evergreen macchia, includes a groomed lawn,and borders the rocky coast. Snorkeling and diving are favorite activities in the area. A small pathway with rocks along the sea leads two hundred meters to the white-sand beaches of Genn’e Mari. In the high season, this beach is only frequented by guests of the villas, and in the off season it is nearly empty. Villa Stella Maris is a spacious house located on a pristine plot of land. The villa faces south towards the sea and has a beautiful natural stone façade. Indigenous macchia and ancient olive trees highlight the garden which has been left in its natural state, surrounded by a traditional Sardinian stone wall. The romantic garden is nearly one thousand square meters and borders the sea on its outer edge.there you can find two showers outside. Life in the outdoors is a staple of Mediterranean living, and with the covered terrace of Villa Stelle Maris, guests can experience the luxury of enjoying time outside. A traditional Sardinian barbeque fits perfectly with the décor of the house. Villa Stella Maris is formed as a rotunda and boasts nearly two hundred square meters of living space on different levels. There are available two Four bedrooms offer eight beds in total. There are three bathrooms and a guest WC, a large and comfortably furnished living room. Below this lies another living space with an indoor fireplace and a dining table. The well-equipped and spacious kitchen has a washing machine, a dishwasher and a large refrigerator. Villa Stella Maris lies on the outskirts of the developed property in the area with it#s spacoius garden surroundings. Enjoy the video of villa Stella Maris! One kilometer away is a pleasant supermarket run by Mrs. Palmira. There you can purchase handmade “pasta fresco.” In Torre delle Stelle there is a diving school and several restaurants which are all reachable on foot. “Il Saraceno” is the closest and is open year-round. For variety and entertainment, you have the sights of Cagliari (including the best restaurants and the Teatro Lirico) which are only 25 minutes away by car. 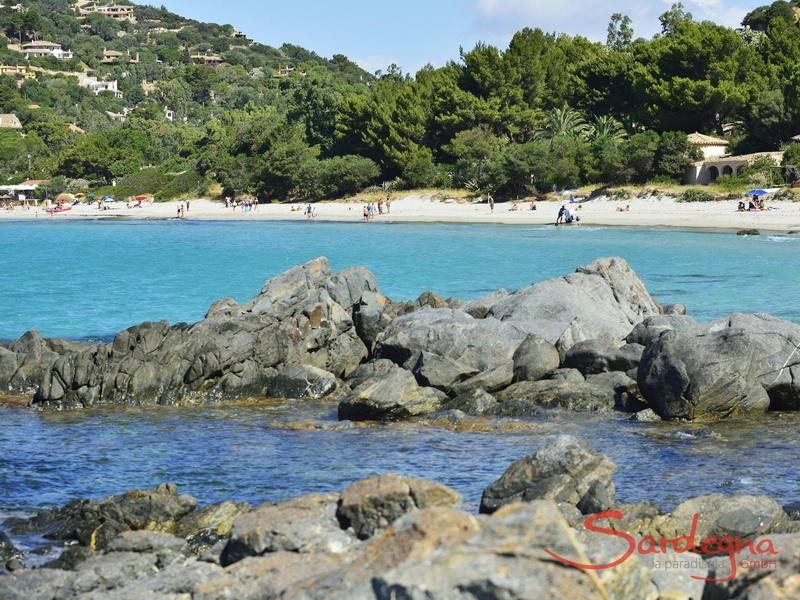 Excursions into the charming surroundings lead you to the beaches nearby, to Solanas, Porto Sa Ruxi and to Costa Rei. 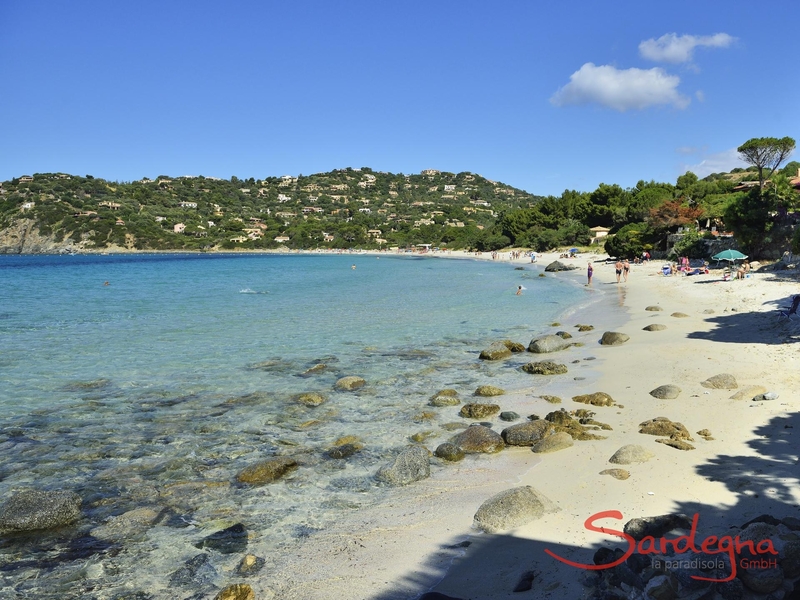 One motor boat rental can be found in the marina of Villasimius, a lively village, where you can find a wide range of boutiques and shops offering Sardinian handicraft. A rocky coastline and a one-of-a-kind private villaVilla Stella Maris is located amidst an enchanting landscape of sandy coves, turquoise-blue fjords and astonishing rock formations. The house is situated on a tranquil property directly on the sea. 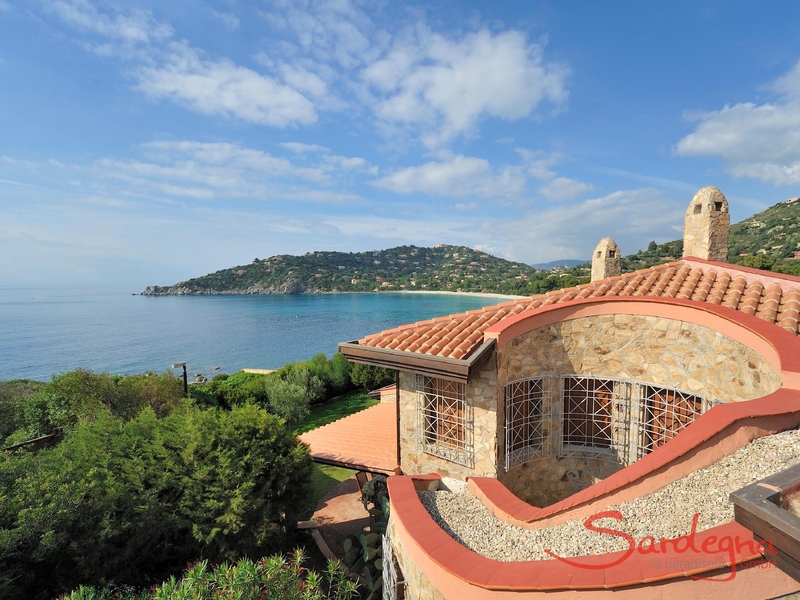 From the house, guests have a fantastic view of the water, the amazing sand dune of Torre delle Stelle and the undeveloped chains of hills in the distance. The Mediterranean glitters before your eyes underneath the midday sun. The garden, which plays host to wild olive trees and evergreen macchia, includes a groomed lawn,and borders the rocky coast. Snorkeling and diving are favorite activities in the area. A small pathway with rocks along the sea leads two hundred meters to the white-sand beaches of Genn’e Mari. In the high season, this beach is only frequented by guests of the villas, and in the off season it is nearly empty. Sea and beach glimmering through the olive treesVilla Stella Maris is a spacious house located on a pristine plot of land. The villa faces south towards the sea and has a beautiful natural stone façade. Indigenous macchia and ancient olive trees highlight the garden which has been left in its natural state, surrounded by a traditional Sardinian stone wall. The romantic garden is nearly one thousand square meters and borders the sea on its outer edge.there you can find two showers outside. Life in the outdoors is a staple of Mediterranean living, and with the covered terrace of Villa Stelle Maris, guests can experience the luxury of enjoying time outside. A traditional Sardinian barbeque fits perfectly with the décor of the house. Villa Stella Maris is formed as a rotunda and boasts nearly two hundred square meters of living space on different levels. There are available two Four bedrooms offer eight beds in total. There are three bathrooms and a guest WC, a large and comfortably furnished living room. Below this lies another living space with an indoor fireplace and a dining table. The well-equipped and spacious kitchen has a washing machine, a dishwasher and a large refrigerator. Villa Stella Maris lies on the outskirts of the developed property in the area with it#s spacoius garden surroundings.Enjoy the video of villa Stella Maris! Markets, restaurants, day trips and cultureOne kilometer away is a pleasant supermarket run by Mrs. Palmira. There you can purchase handmade “pasta fresco.” In Torre delle Stelle there is a diving school and several restaurants which are all reachable on foot. “Il Saraceno” is the closest and is open year-round. For variety and entertainment, you have the sights of Cagliari (including the best restaurants and the Teatro Lirico) which are only 25 minutes away by car. Excursions into the charming surroundings lead you to the beaches nearby, to Solanas, Porto Sa Ruxi and to Costa Rei. 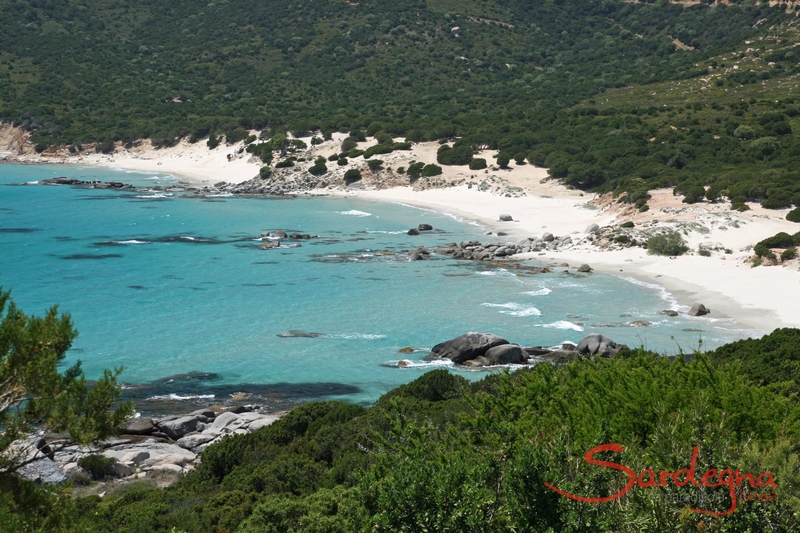 One motor boat rental can be found in the marina of Villasimius, a lively village, where you can find a wide range of boutiques and shops offering Sardinian handicraft. Apartment Azzurra is one of the lovingly furnished apartments in a two-storey private house. The view extends far over the azure blue sea to a private bay with fascinating rock formations accessible by descending a small staircase - pure privacy. Book now and relax!